Economically and politically, Myanmar has undergone vast changes in the past few years. In fact, the country as it is today is almost unrecognisable from the military ruled, closed economy of not so long ago. The first contested election in 25 years was held in early November 2015, yielding a new ruling party in the National League for Democracy (NLD), and the economy has been opening up for several years, as evidenced by increased tourism, foreign direct investment and the burgeoning clutch of multinational companies (MNCs) in Yangon, the country’s biggest city. As yet, however, the country’s property market has been stuck in something of a low gear. With MNCs came foreign expats and developers hoping to cater to their needs and desires. Luxury developments followed and rental prices in the city skyrocketed. But while other sectors have opened up to foreign investment, the property market as it stands is frustratingly off limits. Foreigners are barred from purchasing or owning condos in Myanmar unless in a joint venture with a Myanmar native or through a build-operate-transfer (BOT) lease agreement with the government for 70 years. After a boom period when local investors benefited from increased rental demand, stagnation has now set in. A Condominium Law that would grant the right to buy to foreigners (with caveats) was recently approved by the Union Parliament in January. The progress on its passing had been maddeningly slow in the last three years. In anticipation of the last November election, the political process inevitably slowed down, meaning that the condo law was kicked into the long grass. But, with oversupply beginning to look like a major issue, many experts feel that the law represents the best method of kick-starting the market. A recent Colliers International report found that take-up rates during H1 2015 were at an all-time low of 49 percent. Total unsold inventory at the end of H1 2015 stood at 6,654 units – double the figure for the whole of 2014. Despite substantial wealth among the elite, Myanmar remains a desperately poor country, meaning that locals are unlikely to pick up the slack. Hope, say many, rests with foreign investors. The Condominium Law was originally introduced to the legislature in 2012, but has been batted backwards and forwards between the upper and lower houses of parliament ever since. Although in its substance the law is primarily concerned with providing a legal and regulatory framework for owners, one of its key powers is paving the way for foreign ownership. However, debates continue to rage over issues such as what actually constitutes a condominium and the fundamental issue of whether foreigners should be allowed to own property in Myanmar at all. “Many fear that allowing foreigners to own properties will force prices even higher,” Ramaswami commented. With so much contention still around, the condo law as it stands may not be a satisfactory solution believe experts. The macropolitics of Myanmar don’t make the future of the condo law any less opaque. The new NLD government is a symbol of hope for many, but their successful election campaign was high in principles, but relatively short on policy. 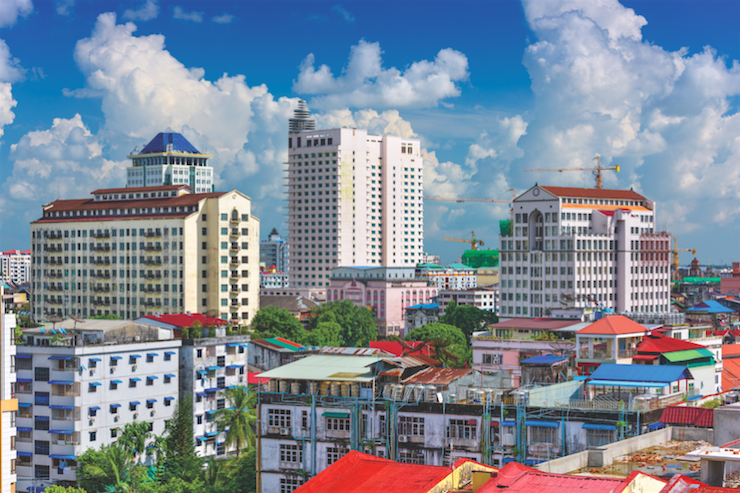 With the new government expected to make its intentions on real estate clearer in the months ahead, time will tell if the Condominium Law will open a new chapter in the Myanmar property scene. The Ministry of Construction is expected to announce further details of the Condominium Law, including floor designation, number of apartments, parking lots, and other building measures, in the coming months. “We will have to wait and see what the new government’s view of real estate and land law will be, and if this includes any positive opportunity for foreign involvement,” said Emerson. After years of frustration, it appears that patience will have to remain a virtue for long-time supporters of the Condominium Law.